While in Port Blair you must visit Corbyn Cove, a picturesque and busy beach of Port Blair encircled with tall green palms. The beach is just 8 kms and incidentally the nearest beach to the center of the city. During our trip while driving from the airport to the hotel Eco Palm Grove Resort you will pass Corbyn Cove on the way. After landing on the island, the first wonderful view is that of this Cove! Check out this article to about Corbyn Cove and what to do there. Searching for the nearest picturesque beach in Port Blair? 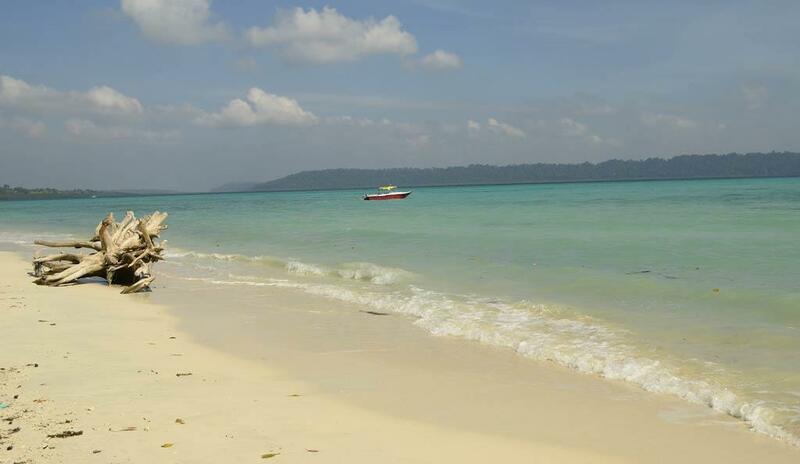 Then Corbyn's Cove Beach Port Blair is the right place to visit. This beach is a popular destination for tourists because of its beauty, and ample things to do. You cannot miss a visit to Corbyn's Cove Beach if you happen to be on a holiday to the Andaman Islands. Enjoy reading this article. Andaman and Nicobar Islands is a Union territory of India in the Bay of Bengal. It is a great habitation of the aborigine tribes many of which are protected as per intimation from the government authorities. If you are lucky you can a look of the Jarawas or the Onges. Not all habitable islands are tourist destinations since they have not yet been developed. This is because all supplies to the islands come from Indian mainland- Chennai/ Kolkata/ Vishakapatnam. There is a lot of dependency on supplies. Main languages spoken in the islands is English, Hindi, Tamil, Bengal etc. Any trip to these islands start from and end at Port Blair. All boats to major islands- Havelock, Neil, Long Island etc. happen to start before lunch time and also return from these islands to Port Blair post lunch. These timings do not match with the flight timings, hence 2-night halts are necessary at Port Blair. One major tourist attraction is Corbyn's Cove Beach Port Blair, a beach encircled with tall green coconut palms providing a wonderful view of the sea and a serene place to relax. Lots of people, tourists and even locals visit the beach all through the day and thus make it a busy beach. But first, its location and how to reach this attraction. Corbyn's Cove is the closest beach to the city of Port Blair the capital of Andaman Islands. It is at a distance of mere 8 km from the City center. The drive to the beach is no doubt a stunning visual treat for the tourists. The coastal road winds across small hills, going high and low and is a scenic journey. You will come across several Japanese World War II bunkers along the way to the Cove. These bunkers will bring back memories of the past and if your driver was an island resident , then you may tell you a story or two of the Japanese invasion of the islands. Another beautiful attraction on the way you may cross is the Marina Park , a beautiful blue sea lining along the route. You can travel to the Cove by a local bus, auto rickshaw, rent a scooter or car, as you wish. It takes about 30 to 45 minutes to reach the beach. Clean and well-maintained bathrooms and changing rooms are also available at the beach in case you happen to take a dip in the ocean. But beware, sometimes crocodiles are seen around in this area. One of the most unforgettable views of Corbyn's Cove Beach in Port Blair is sunrise. Vendors sell few local handicrafts which may suit your taste are reasonably priced. Sometimes the people leave the beach dirty even though ample dustbins are lined up on the beach and sweepers try their best to keep the beach clean. After knowing what to see and do at the Cove, read on where to stay around this place. When we visited the Corbyn's Cove beach, I just could not take my eyes of the sea. During my trip to the Andamans, iIt took quite a while for me to inhale the fresh air, take in the serene and picturesque view of the tall green palms along the beach, enjoy a dip in the water, relax on the ground and listen to the waves lapping on the beach while the salty winds rush to your ears. While writing this article memories have rushed back and I can see the beach in front of my eyes! You can choose from a variety of options to stay near the beach. Most of these accommodations are just awesome and are government and the private type of resorts. The Peerless Sarovar Portico Resort is the only beach resort in the city, being right on the beach. The Hornbill Nest Guest House is another wonderful place to stay. A private resort called Ripple resorts is another choice for you. Most of these resorts serve very good South Indian meals. These reports are located at a distance of nearly 15 km Port Blair airport. No one visits Port Blair only for the beach, but in case you are looking for taking a break from the hustle and bustle of the city then Corbyn's Cove is a must see a place for you.